At this time the Council of Light is calling forth all Light Workers, gathering them together as One aligning the energetic vibrations with that of the coming times in our Universal evolution. In all of this Archangel Michael is “he who commands the league of light” calling for all those upon Mother Earth to align with the light of God. Adele was guided by Archangel Michael and her Counsel of One – the Angelic Wise Ones to record these new meditations coming your way. Giving to all upon Mother Earth in a loving gentle way to assist with the vibrational shift of energies. To be initiated into the Alliance of Angels Light raising your energy vibration, acclimating you, aligning you into the League of Angels with Archangel Michael. This is the first of this collection that Archangel Michael as is given to Adele. 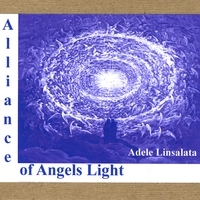 Alliance of Angels Light is simply out of this world beautiful as you will find yourself among the Angels Light in the Kingdom of Heaven. Journey through the vortex of light moving among the millions of Angels in the universe, as they illuminate you from the inside out, cleansing, clearing , aligning you with their heavenly vibration to discover who you are. In these times before us we all need assistance in our journey Alliance of Angels Light brings you into the Light realms of the Angels. You will be made whole in the alliance of the Angels lights, rising up through the Universe into the white mist energy vortex of Angels Light aligning you with the Angel’s strength, peace and light to move forward as a light worker on Mother Earth. Initiation is your introduction into the Alliance of Angels Light. Meeting Master Jesus as he activates your cellular coding symbol of the kingdom of heaven in your heart space. Receiving your divine Angel Wings as you fly among the Angels Light in the Angelic Realms, moving you forward as a servant in the army of Angels Light. Raising your energy to a higher level in your own awakening ascension process. As Light Workers it is time to move forward in all we do, join the Alliance of Angels Light changing the world as we know it to be that of Love.